Kristen and I made these all the time in Lubbock. They are so good! I try not to make them unless I am giving them away because I will just eat myself sick. Cover a cookie sheet with foil. 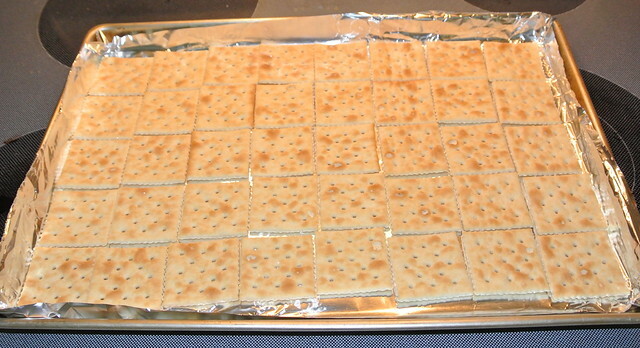 (don't skip this part, foil is very important) Line the whole sheet with saltine crackers. In a saucepan, melt 1 cup of butter (2 sticks) and 1 cup of brown sugar. I let the butter melt first on medium high heat and then add the brown sugar. Stir them together. When it begins to boil, STOP stirring and let it boil for 3 minutes. 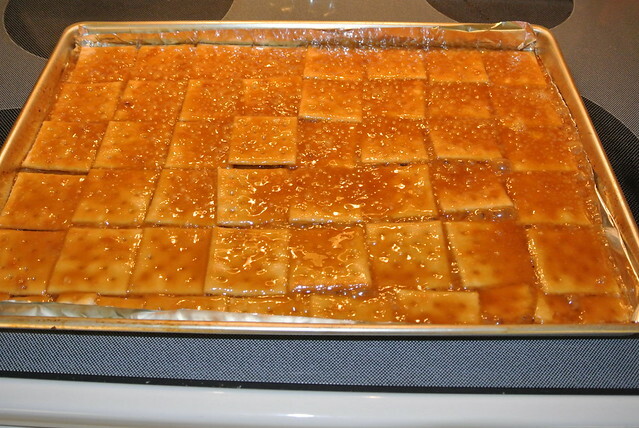 Then pour over the crackers. Put in oven for 5 minutes at 400. 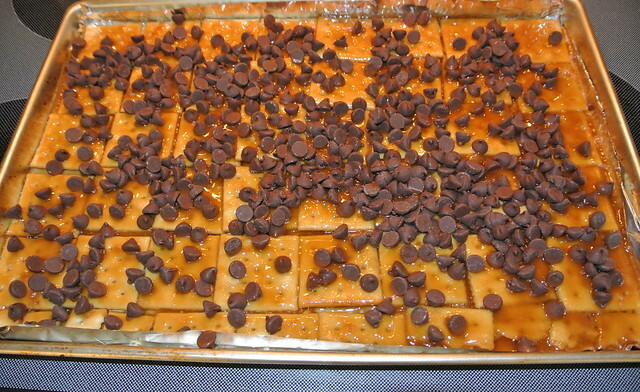 Once they come out of oven, sprinkle 2 cups of chocolate chips on top and let set for a few minutes. 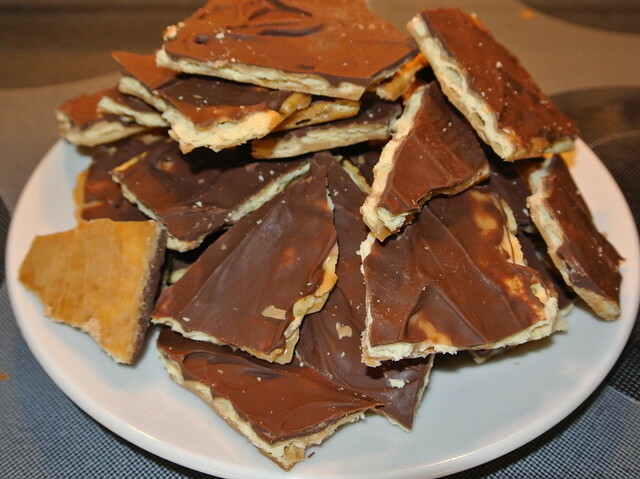 They will start to melt and you can spread them all over the crackers. 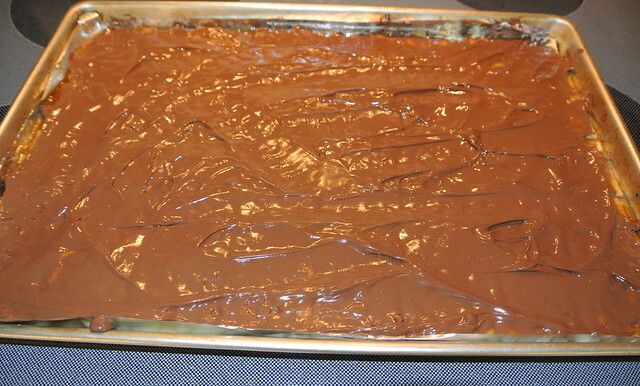 I then put the whole cookie sheet in the freezer for about 20 minutes and let everything harden. Once it is set, just break it up into pieces and enjoy! I like to keep mine in the freezer. I bagged some up for Ella and McKenna to give their teachers for a little Halloween treat. Oh no!!! These are my favvvvvorite and had not crossed my mind until this post and now I NEED THEM RIGHT NOW. Ha! 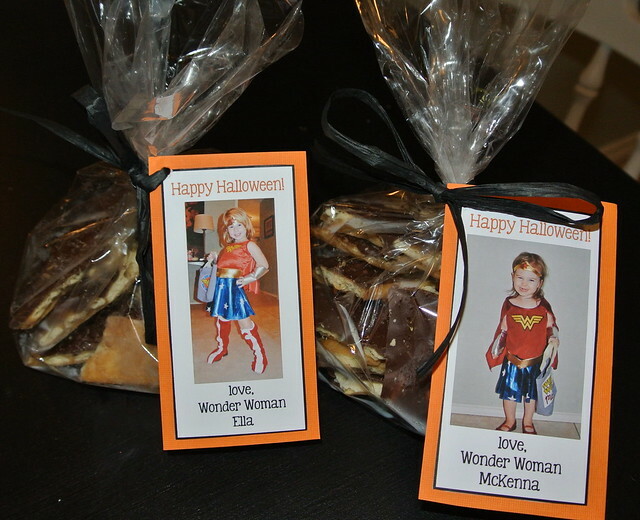 I love the idea of bagging some up for Halloween treats... your little Wonder Women are too cute! YUM!!!! These DO look dangerous! I have to make them immediately! these sound awesome & I can't wait to make them :) How cute are your littles in their matching costumes!? Love McKenna's smile! It's the best. I made them with semi sweet chips and they didn't spread very well..definitely gonna try milk choc chips next time.